Stand in awe as massive explosions unfold in full 256 colors using software alpha compositing. TASO 131 is a multiplayer action game from the 1990s. 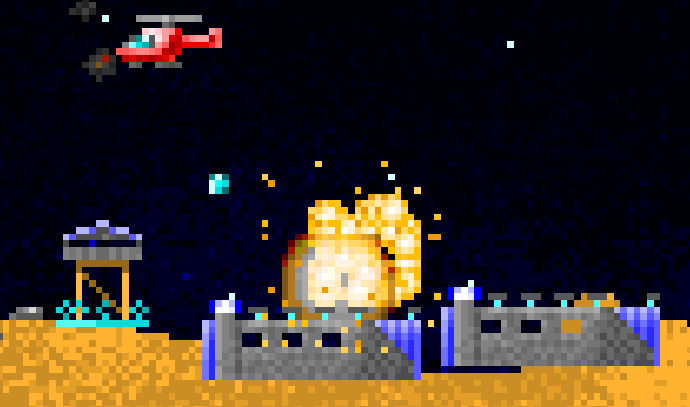 Players use helicopters, cruise missiles, ground troops and paratroopers to destroy opponents’ bases while defending their own. In the campaign mode, players also design their own bases in a manner similar to real-time strategy games, constructing buildings from barracks to air defence systems. I started developing TASO in 1993 when I first started learning C/C++ and Assembler. Over the next few years I played it with my brothers and friends in the neighborhood and kept adding features that we came up with. Some friends, especially online friends that I made through my BBS, contributed background songs to the game. The last version, TASO 131, was released in 1998. When I last tried this, my keyboard was a lot bigger and my friends’ hands a lot smaller. During the 1990s, there was a whole scene of young guys in Finland making and playing small action-oriented PC games like this, known as suomipelit (“finngames”). The games were distributed via disk swapping and through bulletin board systems (BBS), and eventually also through the Internet (see TASO’s entry in Suomipelit.fi). 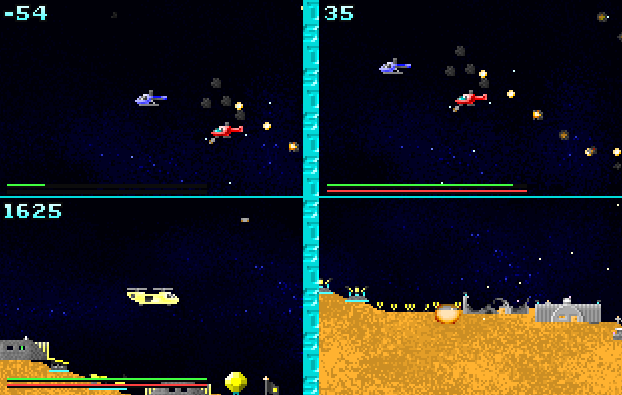 Many of the most popular finngames, like AUTS and Wings, were split-screen multiplayer flying games inspired by a Finnish Amiga game called Turboraketti. TASO combined split-screen flying with elements from the first real-time strategy game I ever saw, Dune 2. The result was fairly successful. In 1997, TASO was awarded the first prize in a national game development competition co-organized by Housemarque. TASO 131 supports up to four players, which can be AI players or human players playing on a single computer using split-screen graphics. Fitting eight hands on a single keyboard is an interesting metagame in its own right. Code and most graphics were created by Vili Lehdonvirta. The intro music, Still out of the dark, was composed by Serum. In-game music was created by Seer, Aga and Queek. End music, Files deleted, is by Seer. The Midas Digital Audio system was written by Petteri Kangaslampi and Jarno Paananen. For ideas, playtesting, level design and general gaiety, I wish to thank my brothers Pyry and Otso, as well as the neighbourhood guys, including Miikka, Tuukka, Sami, Henkka, Tumppi, Marko, Mixu and Jussi (and someone I’m probably forgetting). Thanks guys! The impetus for putting this site up also came from Miikka and Sami. The name TASO means ‘level’ in Finnish. I’m not sure why the 13-year-old me thought that would be a great name for a game.